Each school has a distinctive pin with its own meaning. Many schools have pins based on the official seal of their school. That is true of the University of Wyoming, School of Nursing. The basic design the shape, metal, and color is symbolic of its meaning. The pin reflects the spirit of service to humanity. The metal is yellow gold; the outer circle brown enamel. These are the colors of the University of Wyoming. The open book on the pin symbolizes knowledge and depicts the ideal of "Man's right to knowledge and the free use thereof." The basic knowledge essential to the practice of professional nursing has been acquired by the graduates. The quill across the open book symbolizes that "The pen is mightier than the sword." It implies that not only do you use knowledge in the practice of professional nursing, but that you have a definite responsibility to add to the body of nursing knowledge. This means that professional nurses engage in research and continue to learn during their lifelong practice of nursing. Equality reminds us that Wyoming has had equal suffrage and equal opportunity. The word Nursing relates to the Code of Ethics for Professional Nurses. The professional nurse respects the dignity and worth of every individual. Nurses provide the caring health promotion, maintenance, and rehabilitation. Think about asking for the pin as a gift from your family. Most families want their graduate to own a pin. 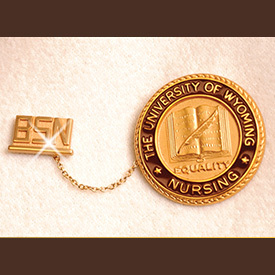 When ordering your nursing pin, you will have choices in regard to pickup or shipping. Students who will be picking up the pin and participating in the ceremonies will have the opportunity to wear the pin to the ceremonies if desired. Order the pin through the University Store.